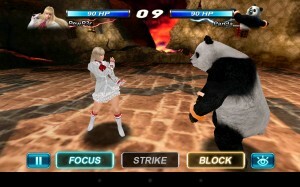 Panda is but one of several fighters appearing in this unique spin-off of the console classic, Tekken, and he’s still just as huggable as ever. 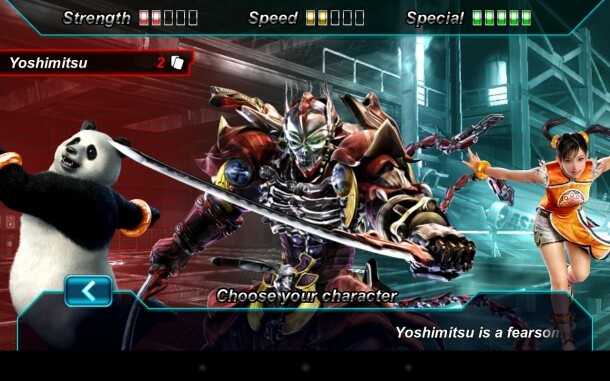 Tekken Card Tournament pits you against the usual barrage of combatants – Law, Li, Yoshimitsu, and co. – in single-round “K.O.” tournaments where controller button combos have been replaced by digital cards. 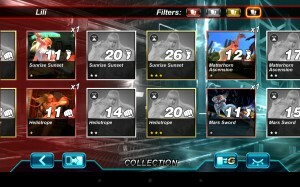 Customize a deck of at least fifteen of these move-cards and pit yourself against the usual suspects in either Arcade (single player), Free Fight (online multi), or Championship (tournament) modes. The more you fight, the more gold, credits, and xp you gain, but you’ll also drain your stamina – forcing you to either pay to keep playing or take a time-out until you’re refreshed. 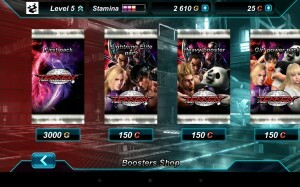 As with any CCG (collectible card game), the goal of Tekken Card Tournament is to constantly lust after bigger and badder cards to add to your repertoire. You begin with a single character, Li, and a deck of 15 cards. A simplistic tutorial attempts to guide you through the basics, but provides only adequate information to get started. While this game isn’t rocket-science, there are a few subtleties that need to be learned in order to master combat. At the most basic level, you’ll be given three options during each round of combat (as well as your opponent) – focus, strike, or block – where your decisions are followed by a brief animation representing the clash. Focusing will leave you open to being hit but nets you a “strike” card. Striking will burn through your list of focused (queued) cards, applying cumulative damage against your opponent post-block. 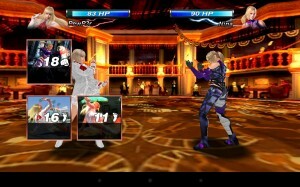 And blocking prevents all damage from the first two strikes from your opponent. Each round, you and your opponent choose one action and hope that the outcome is in your favor. If you manage to queue enough cards that work well with each other (fusion), you can unleash nasty combos that’ll flat-line your enemy in one fell swoop. 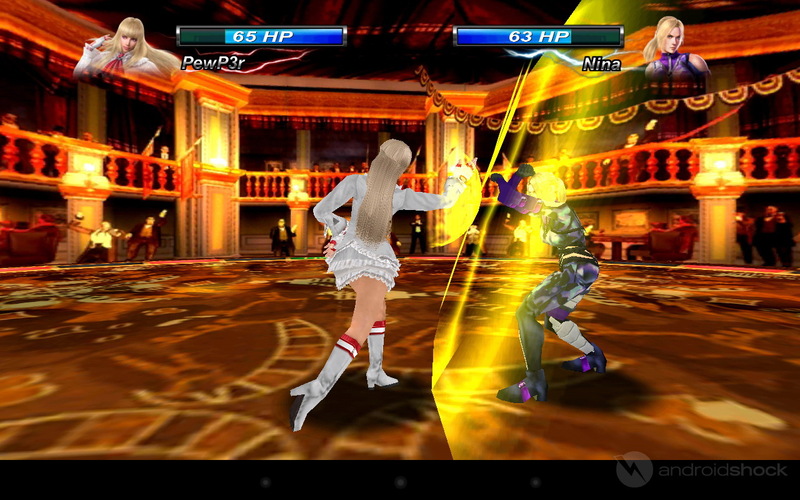 Knock-outs occur when one combatant’s hit-points (hp) reaches zero. Strike cards are clearly the focus of combat, and card fusion ties the strikes together into combos that net special effects such as gaining hp, extra cards, parrying opponent strikes, etc. Basic Strike cards involve only a hand (punch) or foot (kick) icon plus a number (damage). The more complex Strikes come with triggered effects that may occur before or after a strike event. 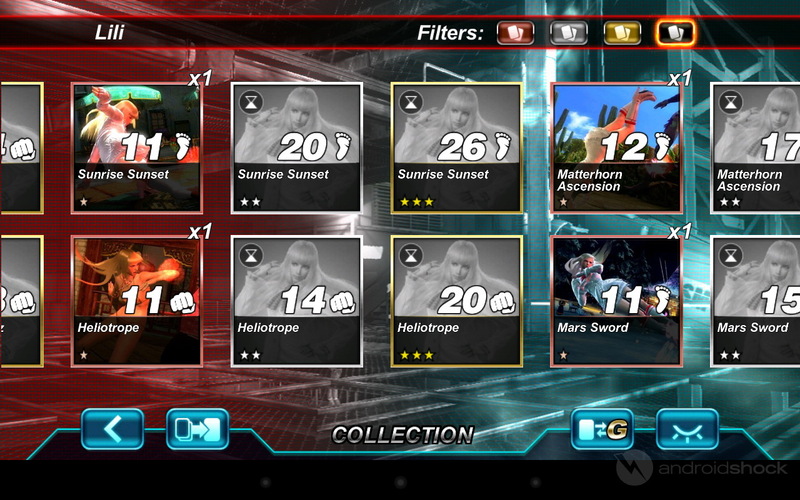 How you customize your deck and time the cards in battle will determine your success. Thus, Tekken Card Tournament – like the title suggests – is all about your cards. As it turns out, the conversion from button to card-combo works quite well but – unless you’re willing for fork over some dough – you’ll be playing and refreshing for a long, long while in order to save up for a measly 3 random cards. Given that all of your other characters begin with ZERO cards… you’d better be prepared for some repetition before wearing a new mask. A simple three-card booster pack costs 3k gold, and it typically takes two sessions of burning through my stamina before I can save that much gold. In one session, I find that I can fight 4-5 opponents before tiring, so I’d guess every 10 fights you should be earning enough for a new pack. 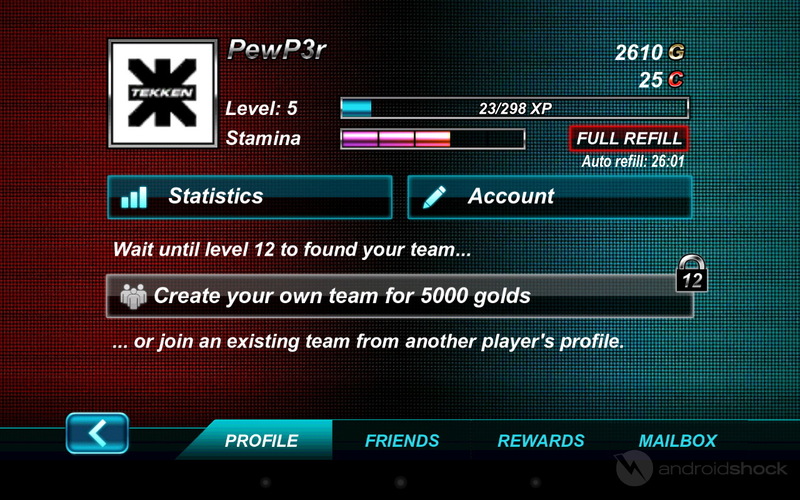 In addition to gold, you also randomly gain “credits” which can be used to purchase specialized packs. Of course, you can also buy credits with cash. The pace of gaining new cards in Tekken Card Tournament is a bit slow and tedious for my liking, but you’ll gain new cards often enough to not get bored… barely. If you want to buy or sell individual cards, you can do so in the Marketplace, but singles are quite pricey. The net-effect of the slow gold and credit accumulation is that you’ll be playing the initial character, Li, for quite some time. 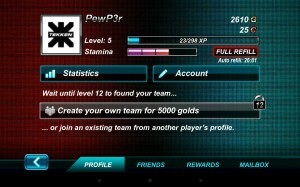 Sadly, playing against real-life players online doesn’t seem to garner any more xp or gold than does fighting against the A.I. Graphically speaking, Tekken Card Tournament’s animated scenes look quite dated – perhaps reminiscent of the old PS2 days. That being said, I really liked the way the card queue translated into a slick set of combos in the resolution animation, complete with dramatic slow-downs. I also liked that they let you choose from many different avatar “banners” and customize your name as it appears during Free Fight mode. One thing I haven’t toyed with is creating or joining a “team” – likely akin to a guild in most other games. 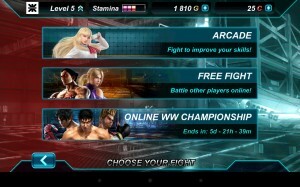 Over-all, Tekken Card Tournament is a clever adaptation of the original console fighter that drives you to keep playing in order to gain more powerful cards. Unfortunately, unless you’re willing to spend some cash, gaining enough cards to make the other characters playable will take quite a bit of time. 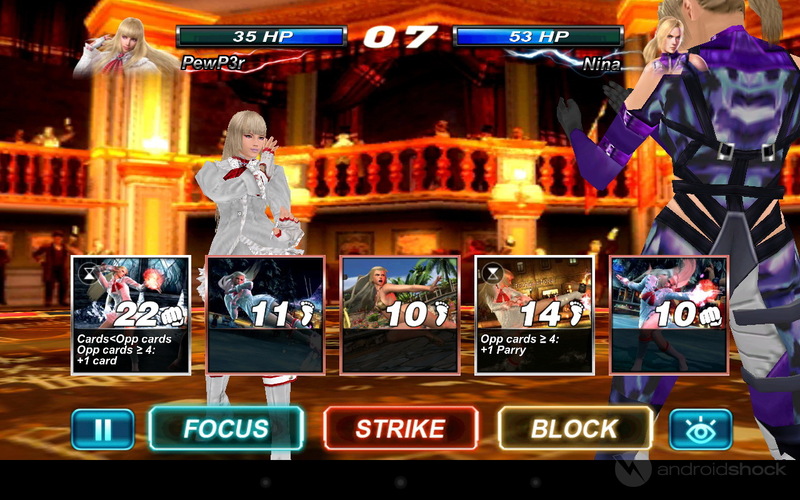 The graphics are a bit dated during the fight-resolution animations, but the focus of this game really is in the strategy of timing your moves – knowing when to Focus, Block, or Strike. As you gain experience, you’ll start to notice patterns and better be able to predict when an opponent is more likely to make certain moves. Multi-player is slightly laggy and no more rewarding than single-player, so I’m unsure as to how valuable it is as a PvP style game.